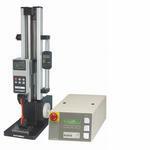 The ESM-DC is an advanced motorized test stand offering all the mechanical specifications of the ESM. The stand has a capacity of 200 lbF, and is configurable in many positions to accommodate a wide variety of sample shapes and sizes. A manual fine adjustment knob allows for fine positioning of the crosshead position, and a stepper motor prevents speed variation with load, making testing more precise and repeatable. The ESM-DCs controller adds a significant amount of sophistication, including an extended speed range, PC control capability, programmable cycling, auto return, overload protection, and other features.